Handcrafted embroidered pillow. Black white grey abstract floral. Subtle Sequins tone on tone highlight. Ivory ground. Black back and piping. Feather pad. Handcrafted pillow Hand embroidered in mohair yarns, white, gold, black and grey with a copper and gold metallic thread highlight. 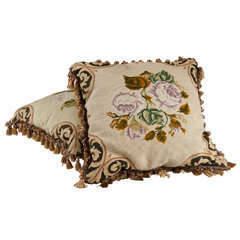 Pair of 19th century Continental floral needlepoint pillows with elaborate fringe and plaid taffeta reverse sides, 20th century. Upholstery. Kelly Wearstler white black grey cotton pillow This pillow is part of Kelly Wearstler Home Collection. The drawing is embroidered. There's the hinge. Dry clean only. This decorative pillow, inspired by Chinese Art Deco rugs, is embroidered with hand-steered chain stitch embroidery on luxe silk wool sateen. Made in New York City by a skilled artisan.